The American Heart Association offers you some tips for healthy eating. Today is an opportunity to kick off some new habits that may just stick. Little by little, you’ll start to see a difference in how you feel and look. Eating healthy isn’t just something to do on National Eating Healthy Day; it’s something you can do every day. And if you slip up, then start over tomorrow. Every day is a new opportunity. Whether it’s increasing physical activity or eating healthier —happens one day at a time. If you devote one day to healthy eating, you will know you can do it again and learn to enjoy it! Americans eat more than double the daily amount of sodium recommended by the American Heart Association. Too much sodium increases the risk of heart disease, stroke and other health problems, but this excess isn’t just from salting at the table. Americans get most of their sodium — 77 percent — from processed foods. If you choose these foods, compare the labels and look for lower-sodium versions. Choose all kinds of fruits and vegetables — fresh, frozen, canned, juiced and dried. 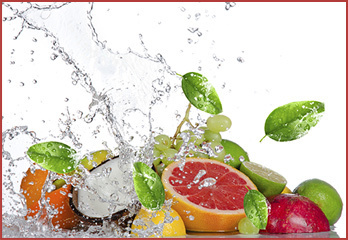 Fruits and vegetables contain vitamins, minerals and other nutrients. Look for fruits and vegetables of many different colors. Then try a “healthy sauté” using a small amount of liquid to cook vegetables. Need a quick, healthy weeknight dinner? Try a salad. The American Heart Association has tasty recipes packed with such items as tofu, broccoli, mushrooms and much more. Learn how to substitute good fats (mono and polyunsaturated fats) for bad fats (saturated and trans fats). For example, try canola oil or olive oil instead of butter. Choose lean meats, poultry without skin and fish instead of fattier cuts of meats. Enjoy heart-healthy fats in moderation and remember this tip: 1 teaspoon equals 1 serving. Cooking at home is not only a great way to make sure the ingredients are healthy, but portions are correct. Try using a smaller salad-size plate instead of a big dinner plate, as well.